I use Adobe’s Lightroom for my photo library. For the cost it gives my powerful tools and it also make it possible to maintain a sance view of the growing amount of photos taken over the years. Instead of list the features and functions of the applications I will instead explain which tools I use and in what order when I return home from a photo session. Starting in the Library view, import photos and convert to DNG. for more information on DNG, read though my article on the subject! As soon as photos are on my harddrive I start to push them to an off site backup location. As long as the backup is running, the photos are kept on the memory cards. To cut down the amount of pictures I start by looking through them all. If I see a bad picture, I press X and flag the photo for deletion. When all photos have been looked through, from file menu I select Photo -> Delete rejected photos and by doing so remove all photos both from library and from my hard drive. 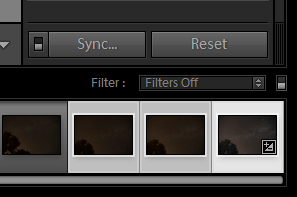 Looking at the histogram in Develop mode, move sliders under Basic until we see a good amount of light in the picture. While doing this, I activate the highlight clipping (the two triangles in top corners of histogram) to see if I lose any details in light or dark. Shortcut ‘J’. U sing the White balance tool, click on a neutral part of the photo (white or grey). If many photos have been shot in the same environment and light I then sync these photos to as many photos as possible to get a good baseline to work with. Select multiple photos in the bottom view and then press Sync button to sync the done changes to rest of marked photos. After these steps the rest is based on that type of photos I have shot. Steps differ alot if it has been a portrait, nature, star sky or something else. Concerning establishing a good white balance, while I agree with being able to grab a pretty good white balance in LR, a more accurate method would be to use a precise colour balance in camera. I tend to use either a small grey card or an Xrite color checker passport to get the exact colour balance. This, or by using a white piece of paper and my camera’s custom white balance feature enables me to get perfect colour under any lighting condition. Even mixed lighting. I have to keep in mind that not every scene will have a white or grey portion for me to use LR to correct for colour shifts. You’re correct in that. For me it’s usually that I tend to forget to white balance when out walking about and due to that I have to fix that when I’m back home. May I ask; if you are out on a photo walk, do you white balance multiple times or do you go for something at the beginning of the shoot and then keep that as good enough? Previous Previous post: Why use DNG?